We present a machine learning approach for predicting fractional flow reserve (FFR) from intravscular ultrasound images (IVUS) in coronary arteries. 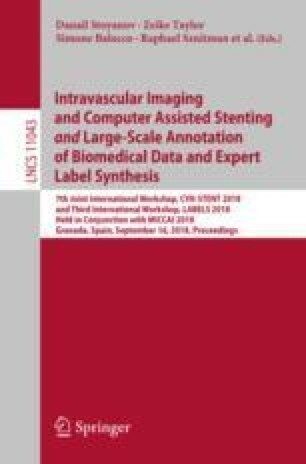 IVUS images and FFR measurements were collected from 1744 patients and 1447 lumen and plaque segmentation masks were generated from 1447 IVUS images using an automatic segmentation model trained on separate 70 IVUS images and minor manual corrections. Using total 114 features from the masks and general patient informarion, we trained random forest (RF), extreme gradient boost (XGBoost) and artificial neural network (ANN) models for a binary classification of FFR-80 threshold (FFR < 0.8 v.s. FFR \(\ge \) 0.8) for comparison. The ensembled XGBoost models evaluated in 290 unseen cases achieved 81% accuracy and 70% recall. This study was supported by grants from the Korea Healthcare Technology R&D Project, Ministry for Health & Welfare Affairs, Republic of Korea (HI15C1790 and HI17C1080); the Ministry of Science and ICT (NRF-2017R1A2B4005886); and the Asan Institute for Life Sciences, Asan Medical Center, Seoul, Korea (2017-0745).